It's time for ELLE's annual "intelligent women" issue! Thing is, the only examples of "intelligence" the magazine offers are Natalie "I went to Harvard" Portman, a horribly-timed interview with Michelle Williams, and something called "The Beauty Genius Awards." So, basically, instead of featuring stories about intelligent women who actually deserve accolades, ELLE gives us celebrities, hairdressers, and make-up artists... all shilling products from ELLE advertisers! (Speaking of intelligence, who chose that horrid cover image of Ms. Portman?) 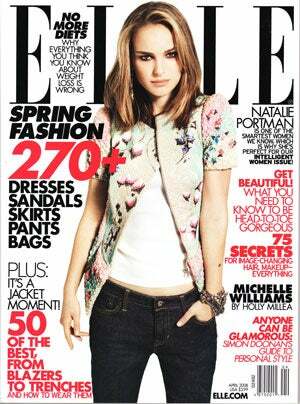 After the jump, Intern Cheryl and I "deconstruct" the complicated cover lies of the April 2008 issue of ELLE.